What the first thing a person does landing in a new city, a new continent, a new time zone? Connects to wifi of course. Narita airport provides a good, free wifi access. 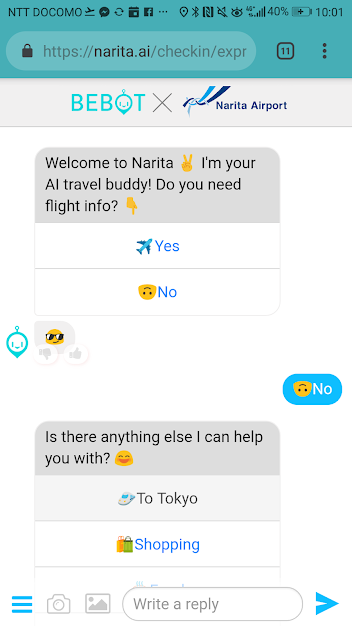 As soon as I was connected, I've been greeted by the "Bebot". This useful "travel buddy" is able to provide me with the most important information I might need at the airport. 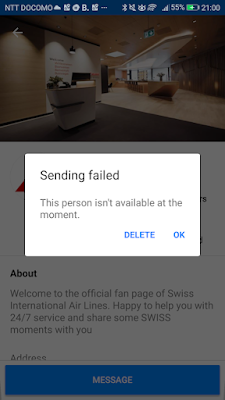 It could tell me about my flight. Where is the check-in or what gate I need. For someone who just landed, it could give tips on how to get to the city. 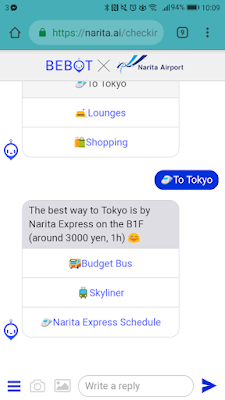 You could choose a type of transport you're interested in (expensive, mid option and cheap) and "Bebot" will give you the schedule and the location of the ticket office. Handy isn't it? Chatbots are not new. The technology exists for several years now. It has been utilized in different industries and for various scenarios. Shopping, customer support, travel, healthcare, education, entretainment...etc. Despite the wide use, I'd dare to say, chatbots haven't yet reached their potential. The reason for that is the implementation mistakes. What's the easiest predictor of a product success? If a new product solves a person's problem faster, easier and cheaper than existing solutions. Unfortunately, not all chatbots did that. There were too many chatbots that made user's journey more complicated, longer and therefore more expensive. It looks simple enough. Still somehow it always easier and faster to just browse the website rather than use it. It provides value but this value is not sufficient to be bothered with changing a usage pattern. Coming back to Narita's airport "Bebot", the story is different. 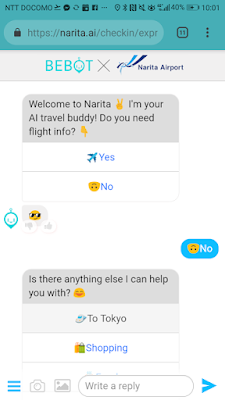 Here the chatbot provides vital travel information faster, easier and cheaper (literally for free) than the alternative products. 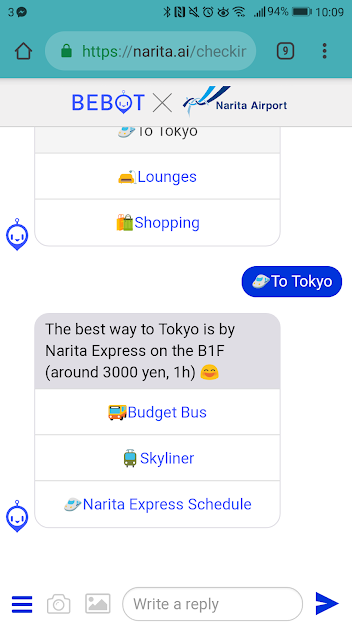 "Bebot" is much more convenient to use than a website (where you first need to find how to switch the language). 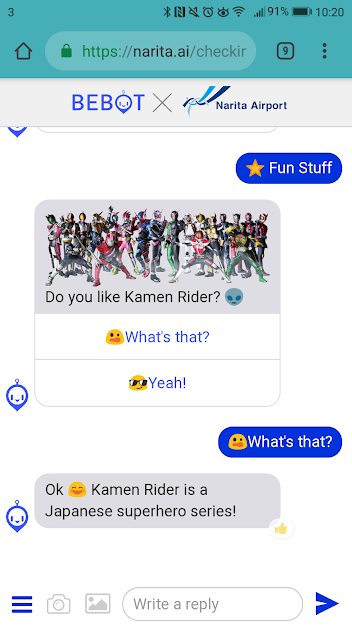 This is chatbot implementation that pays justice to the technology and really solves people problems in a better way. And it also provides some little delighters. What's on the opposite side of the spectrum? An example of a terrible chatbot attempt. So imagine your flight has been re-scheduled. You need to contact the airline to confirm your new itinerary. All starts with a rather inviting call to action: "Chat to us on Facebook". It's great on paper. Much better than to fill-in a multifield form on the website. So you click the call2action. Messenger chat appears. It is promising. You're writing your query, a paragraph or two, and press "Send". What a disaster! Your effort is wasted. There is no one on the other end to talk to you. Not even a simplest of chatbots that will save your query and pass it to the customer support representative. This is a huge shame. As one experience like that and a person would not try again. Even more harmfully, a person might think this contacting method doesn't work at all, for all businesses they might want to get in touch with. It only takes one bad experience. According to the DigitasLBi report, 73 percent of Americans said they wouldn’t use a company’s chatbot after a bad experience. According to Mindshare’s report, 61 percent of people would find it more frustrating if a chatbot couldn’t solve a problem vs. a human. So by getting a chatbot implementation wrong, you're at risk not only to ruin the experience for your customers but also to discredit the technology as a whole. Would it be faster, easier and cheaper for my customers to solve their problem with a chatbot over the current process? Or even better, visualize your customer journey and measure the average time to complete it. 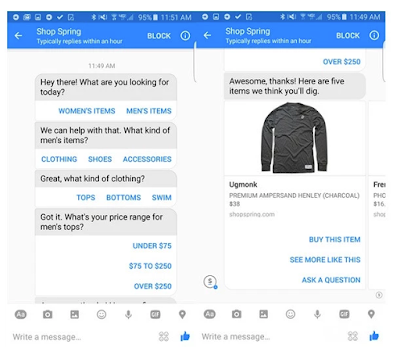 Then do the same with a chatbot that you want to build (no need to actually build a chatbot, you can prototype it or use one of the existing bot platforms). Do that for any new technology you think of applying. It's easy to get lured into using a new technology when it gets hyped. 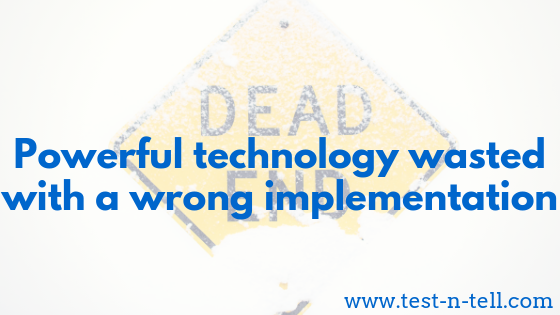 Yet often the bad implementation of a powerful technology could lead to customer frustration. It could harm your business. That's why it's vital to remain customer-centric when thinking of employing any new technology or product. Would it improve the customer experience? How should we implement it so it would be valuable for both customers and our business? The right implementation is the key element of a product success.